The Graduate School will host its campus-wide New Graduate Student Orientation on Monday, August 20, 2018, at 9:30 a.m.—12:00 noon, in the Grand and Colony Ballrooms of the Stamp Student Union. The orientation will be followed by lunch from 12:00 Noon—1:00 p.m. for new graduate students who attend the orientation. A tentative agenda is below. We will continue to update this webpage as the event approaches. Agenda – Event starts at 10:00 a.m. The Graduate School and its Office of Graduate Diversity and Inclusion will also be holding an orientation for the Spouses and Partners of New Doctoral Students (#SPARTNERS). 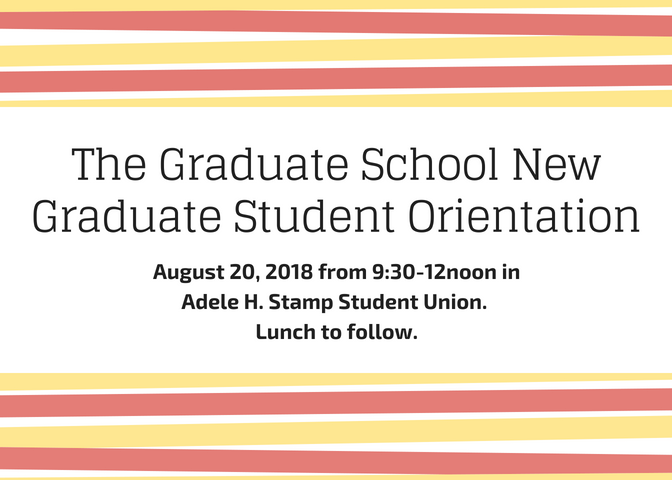 This orientation occurs concurrently with New Graduate Student Orientation and goes from 10:00 am-12 noon on Monday, August 20 in the Prince George's Room of the Stamp Student Union. Open to all spouses and partners of new incoming doctoral students. Spouses and partners of returning doctoral students that have not attended a "Spartner" Orientation are also invited to register. To register for the Spartners orientation, please go to: https://go.umd.edu/SPARTNERS2018.